I have been conducting an experiment when I go swimming, and it seems to be working. Whether it is purely psychological or not, I don't know. The theory works like this: endorphins are released by the body in response to pain, in order to reduce it. 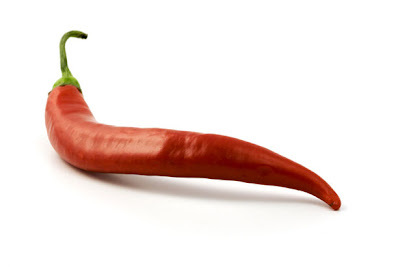 A well known source of endorphins is "hot" stuff like chilies, because the "heat" feels like pain and the body responds. Similarly, the body releases endorphins during exercise, as a response to the exhaustion and pain caused by the exercise. Usually I stop exercising long before this happens, because, quite frankly, I'm a wimp and I can't push through the exhaustion and keep going. As a result my fitness grows at a slow pace because I'm incapable of sustaining any exercise routine that becomes too uncomfortable. "No pain, no gain" is just a cliche, and no amount of macho talk can persuade me otherwise. So I wondered what would happen if I could trigger some endorphins before exercising. Enter the humble chili. If you chew a raw one it causes a short burst of pain in your mouth, which causes the body to release endorphins. I chew enough to make my eyes water, and the sensation lasts for around a minute or so. By the time I have changed and got in the pool, there are still endorphins in my system, and I can exercise without pain and exhaustion setting in for a while at least. It makes the whole exercise experience far more repeatable and not the demotivating nightmare it was before. Add to this some dance music while swimming lengths, and the experience is downright enjoyable. So much so that I have been going to swim nearly every day, thanks to the encouragement from Chris at the Gaining Mass blog. FYI Chris does not use chilis, but he has some good things to say and he has a lot of courage. I would try it if I could handle chilis like that. I get heartburn very easily. You could try cutting the Chili lengthwise and licking it. You are unlikely to swallow enough to cause heartburn, but your mouth will burn!